The first time I heard about this product was from my husband. On his trip to Beijing, China his travel buddy/roommate had this little bottle that had some kind of miracle formula. This "miracle" formula is dropped into the toilet whenever he had to go do the "number 2" and it instantly takes out the foul smell. Robert said it really it worked. The reason I am writing about this is that my good friend Rhea gave me 2 bottles of this yesterday as a travel gift for me and Rob. It's called the Mirapoo. I think it's a very thoughtful gift and we sure could use it on our coast-to-coast road trip in the US. Don't you love clever products like this? I looked Mirapoo online and it looks like it is sold on this person's Multiply site. Hello. 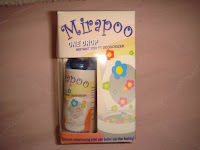 You can also check out Mirapoo at www.pagawaangweb.com/mirapoo. Thank you for including us in your blog.